The umpteenth film version of Bronte's classic novel has a younger cast, hoping for a younger audience. In essence a tale of 'forbidden' love and passion between a young woman and her older boss, the action plays out on a remote windswept estate. Through flashbacks we learn of the woman's past and how she came to be where she is, and slowly the dark secret her boss is hiding is revealed. 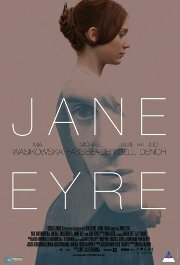 Comments Closely based on Jane Eyre, the classic novel by Charlotte Bronte. Some strongish adult themes.